After exiting the swim course in sixth place, some 38 seconds adrift of the leader Eric Watson, Blummenfelt quickly got himself into contention on the bike leg, taking the lead after 28km in front of his fellow countrymen Caspar Stornes and Gustav Iden, as well as Britain’s Adam Bowden. A gruelling 21.1km run course awaited, and Iden was in no mood to give up the fight and led the way in the early stages. However, Blummenfelt was refusing to hand over the title he won so memorably in 2017, and by the 13.5km stage he was back in front, a lead he never relinquished. The 24-year-old finished the race with an average kilometre split of three minutes 20 seconds on the run course, a phenomenal pace. 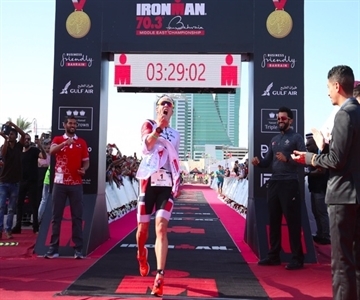 With history made in the elite men’s field, all attention now turned to the women’s race to see if Holly Lawrence – the 2016 IRONMAN 70.3 World Champion – could keep hold of her 2017 crown. Having exited the swim with a lead of over a minute from Australian Ellie Salthouse, Lawrence seemed to struggle in the first few kilometres of the bike leg before regaining the ascendency and moving into T2 again with a lead over Salthouse. The 28-year-old Lawrence – who competed for Wales in the 2014 Commonwealth Games – never looked like letting her grip on the Middle East Championship weaken, and she powered home on the run course to finish in 3:59:20, 52 seconds ahead of compatriot Sarah Lewis, who had overtaken Salthouse earlier during the final leg of the day.